The event runs from April 17th until the 21st. 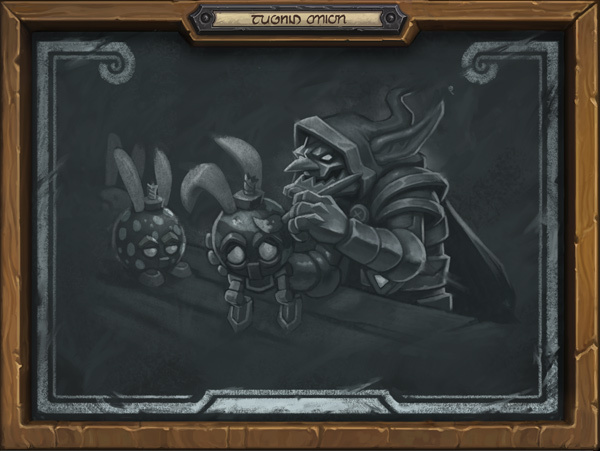 We're getting a special themed tavern brawl with lots of explosives. Logging in gets you 2 GOLDEN Mechano-Egg cards and 2 Boomsday Project packs. But where are the bunnies? I agree it should be a Pogo-Hopper with a Mechano-Egg. So that a mechanic bunny brings a mechanic egg. Definitely thematic, but I assume they want to give us neutral cards for events like this. 2 packs and 100 dust is neat! I hope they change the emote to this. Finally someone says it instead of complaining it's not enough. I think we need to open our eyes to the amount of people thanking blizzard for their generosity. for ever one complainer here there at least three people ready to thank blizzard for the free stuff. Sweet, I wasn't able to get a single copy of those eggs and now I will have two golden once for free. How do we pronounce the name of the event? To be fair, there aren't a lot of familiar words with the 'ig-' prefix. You cannot make a Mechano-melette without breaking a few Mechano-eggs. Thanks for the packs!